I love trying to think of ways to use what would otherwise be waste for something useful. I’ve seen a lot of uses on pinterest.com for toilet paper rolls lately and I think that’s great. There are some beautiful things made with them like this….. So anyway, I was trying to get ride of some clutter and I was thinking… What can you make with old CD’s? I also had a stack of old magazines that I hated to just waste. Here’s what I did. I found a page in a magazine with some pretty flowers and traced around the CD with a fine tip marker. Cut out the circle staying on the inside of the line you traced. Then look through the magazine for words or letters that you can add to the picture. There are so many things you can do. You can also cut rectangles out of colored sections to “frame” the text you want to use. I used a glue stick to position them on my background piece. 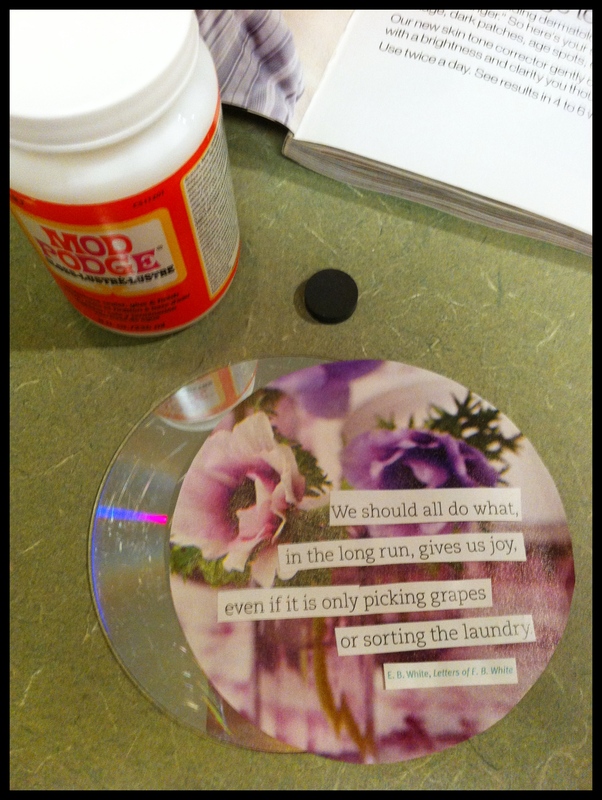 After I had that finished I used a flat paint brush and applied a thin layer of Mod Podge to the CD. 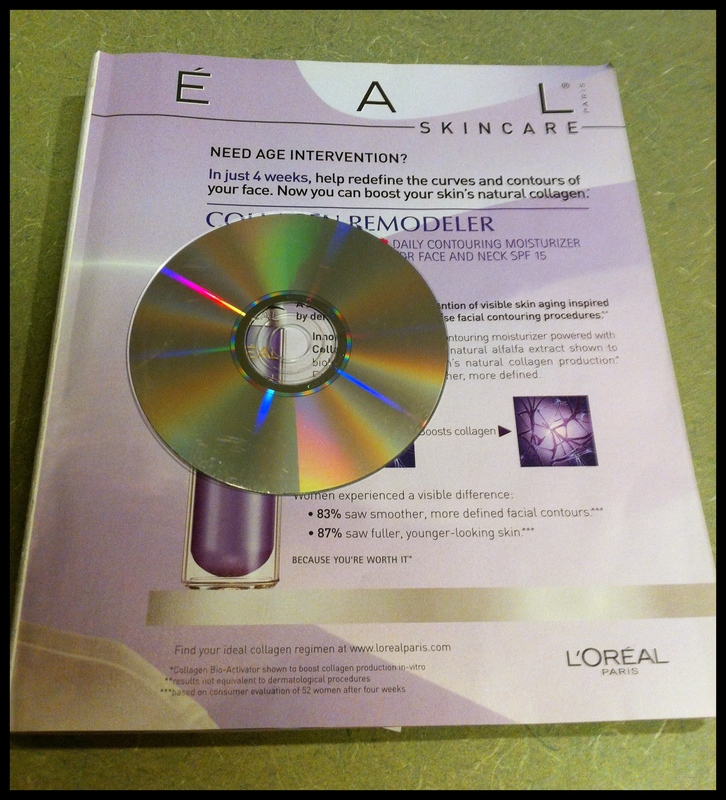 I carefully positioned the circle of paper to the cd trying to push out wrinkles and air bubbles. You need to try to avoid the center area where there is a hole in the CD. 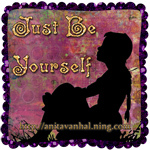 You don’t want to push through the paper that is softened by the mod podge. After that has dried brush a layer of Mod Podge over the top and if you want you can touch a bit to the back where the hole is to strengthen it. Once that is dry you can embellish with some paint or markers, stickers, etc and then add another layer of mod podge to seal it. No need to worry about newspaper to cover the table. Just use the magazine. I also found that glossy magazine pages are great for mixing paint on. 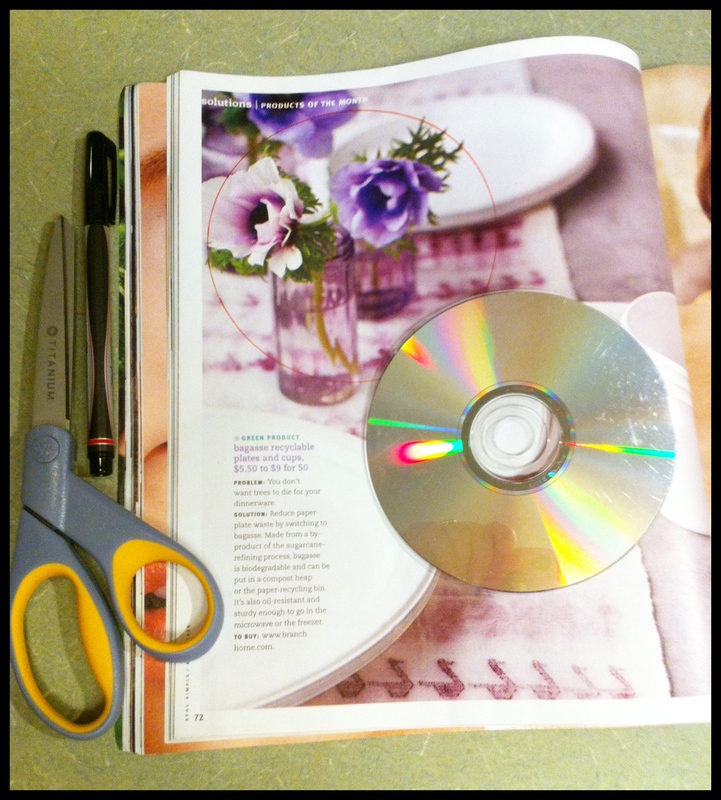 Use Super glue or hot glue to add a magnet to the back of your CD. There are so many things you can do! 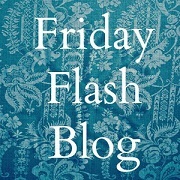 Paint the CD with chalk board paint or glue a paper pocket for holding coupons or other things you want to remember. You could even take a large paperclip and bend the top out at slight angel in the middle. 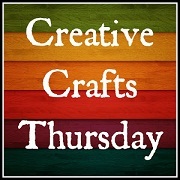 Use hot glue to add it to the back for a wall hanger. Add a quote you like or a motto to help you through a challenge like weight loss. The refrigerator is a great place for a reminder if you are trying to eat healthier. I found another useful idea too. I made this so my kids will know when the dishwasher needs to be emptied and when they can put their dirty dishes in the dishwasher instead of filling up the sink. I blotted orange and gold acrylic paint around the edges to give it a boarder. After that dried I added another coat of modge podge to seal it. I also used a nail file on the edge once it was dry to get rid of any overlapping paper. The word “Clean” was right on the cover of a Real Simple magazine so that was easy. At first I was really frustrated trying to find the word “dirty” or letters that looked good together. I really wanted the font to be the same. I thought I was going to have to print something and then I found the phase “dinner party” in the same magazine. All I had to do was snip the parts I wanted and paste them together. I like your use of it on the dishwasher! 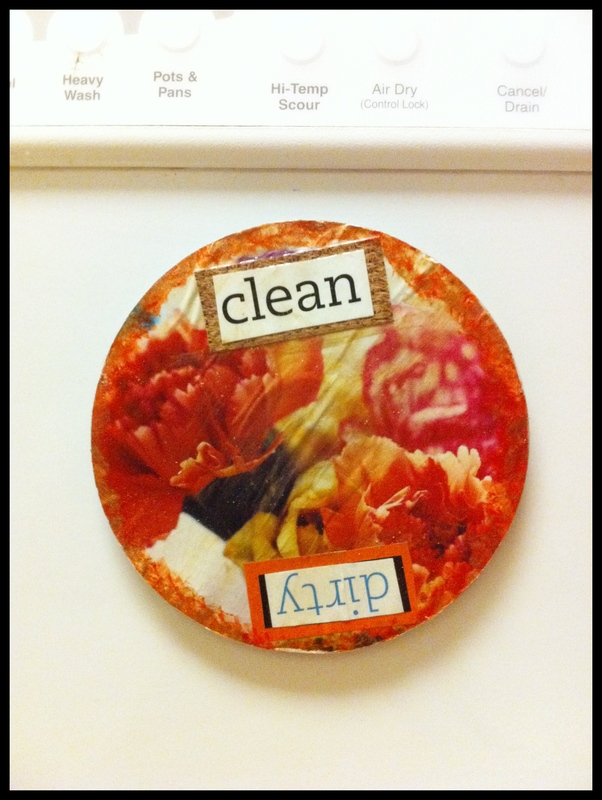 The dishwasher magnet is a great idea!